Although I was taught French for a few years at CBS Synge Street, I don’t recall that the works of Marcel Proust were on the curriculum. Even people who have never read his novels will know that it was the taste of a madeleine sponge-cake which propelled him on his famous journey down memory lane. And on my recent tour of the school with a group of other past pupils I had more than a few “madeleine moments”. Memory lies in wait for you and then jumps out when least expected. When the roll for my Leaving Certificate year 1967 was produced for our perusal on the tour, my name, like all the others, was in Irish. But the spelling was Ó Bríghdeáin, rather than the more-correct version I now use: de Bréadún. I had forgotten how it was rendered back in the day. The classrooms in the old school building, on Synge Street proper, have been converted since 2007 to another and even more praiseworthy use as the Lantern Intercultural Centre, which provides a rare social outlet for immigrants from as many as 30 countries. There is a reception area with five conference rooms and the same number of small kitchens for serving tea or coffee: Áine de Baróid told us of the wonderful work being done, on a modest budget. As we all walked around, my mind went back my days at secondary school there in the 1960s. The place hosted a polling station at election-time and, back in 1965, I encountered then-Taoiseach Seán Lemass on his way in the front door to see how the vote was progressing in that year’s general election. I can still recall the smile playing on his lips as he listened to this cheeky young fella addressing him. Little did I realise then that he was but the first of ten holders of that high office whom I would meet and, in some cases, get to know quite well, in subsequent years, when I covered the political scene as a journalist. As we past pupils walked around, names of former teachers came to mind, such as the legendary Mr Ford, affectionately known as “Buzzer”, who was unusual at the time in that I never witnessed him using the notorious leather strap to enforce discipline. In the same year that I met Lemass I had another memorable political experience of a more localised nature, when there was an election at the school to choose an auditor/chairman for the grandly-titled Synge Street Present Pupils Literary and Debating Society, or SSPPLDS for, er, short. It was a tremendously-exciting contest that gripped our teenage imaginations. The winner was Tony Heffernan who went on to play a significant role in grown-up politics, including a stint as Assistant Government Press Secretary. His opponents were Seán Conroy and Patrick Currivan: sadly, the latter was a passenger on the first plane to crash into the World Trade Center in New York on “9/11”, September 11th, 2001, a few weeks short of his 53rd birthday. Our paths had crossed from time to time after we left school and I was always struck by his courtesy and high intelligence. I ran for auditor myself on another occasion but my opponent’s camp was endowed with better vote-management skills and so I lost, but it was a good lesson in practical politics! That section of the school now houses the Dublin 8 Community Education Centre, managed by Rachel Morrissey, who gave us a comprehensive account of the excellent work carried out there. After that, we were taken into the monastery itself, where the Christian Brothers live. This was new territory for us past-pupils, so we were naturally quite curious about it. I can report that it perfectly matches Eamon de Valera’s famous criterion of “frugal comfort” and that these men of God live in pleasant but not luxurious surroundings. 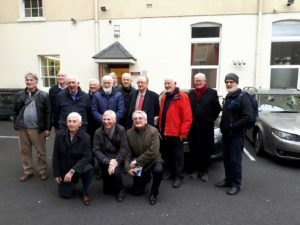 Brother Dermot Ambrose, who is the leader of that religious community, told us there is now a total of 199 members of the order carrying out their duties in Ireland, the United Kingdom and continental Europe. We didn’t get to the primary school, which I attended for two years in the early 1960s before going on to “The Secco”. As a Gaeilgeoir, I found it exciting news to learn that a Sruth Lan-Ghaeilge (Irish-language stream) has been inaugurated at the level of first class and that, for the first time ever, Synge St Primary School has opened its doors to Junior Infants Girls and Boys. In strict geographical terms, what I still think of as the “new” secondary school is on Heytesbury Street although it still retains the prestigious “Synger” title. In psychological terms, past-pupils of my own vintage feel a certain proprietorial interest in the building, since we sold tickets for the Crannchur Gan Stad (Non-Stop Draw) which provided substantial funds for its construction. For a while up to then, my class was located in a house on nearby Grantham Street, but thanks in large part to the dynamism of Brother Fegan, the new school was built in a relatively short time. I still recall the opening-day ceremony, which took place on January 25th, 1967. Prior to a blessing from Archbishop John Charles McQuaid, the front door was opened with a golden key by Donogh O’Malley, who had initiated the historic free secondary education scheme only four months previously. We cheered the Minister for Education when he announced that the boys could have the rest of the day off, but I recall being rather shocked by the stark pallor of his features. Just over a year later, this pioneer of equal opportunity was dead at the early age of 47 years. In former times, schools such as “Synger” did great work in lifting pupils from a relatively-deprived status in society to a level where they could apply their talents and expect a decent reward. It was stirring to hear that the school is doing the same now for the “New Irish” and that no less than 47 different nationalities are represented among the pupils. School principal Clare Catterson greeted us on our arrival in the building and we were given an opportunity to seek our names out in the roll for the year in which we took the Leaving Cert. It was charming to see ourselves listed along with all the other eager young teenagers of yesteryear. There was a touch of sadness, of course, in that some of them have gone to their eternal reward but, no doubt, if they were alive today they would be proud of their Synge Street heritage and the work that is taking place in different parts of the school premises today. Come on Synger! Sean Connolly, Máirtín Mac Aogh. As lathair – Frank O’Donohoe, Bryan Phelan. Tinn sa leaba – Martin Ryan.